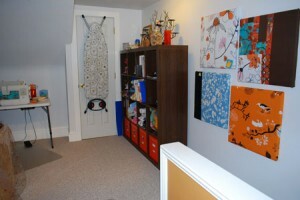 This weekend I dropped off a bunch of new items at Out Of Our Hands in Emmaus, PA. The store sells a variety of handmade items, including my jewelry. 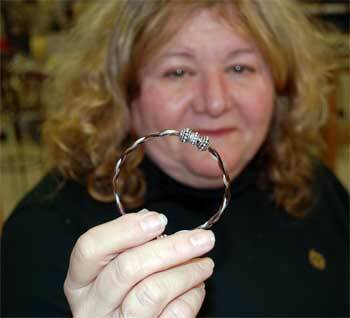 Check out the adjustable horse hair bracelets, perfect for a woman or man. 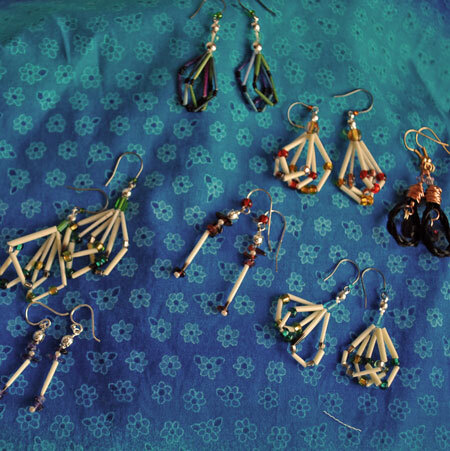 I also created some colorful new porcupine quill earrings inspired by my friend Jessica. While I was there I bought a few handmade items and crossed a few names off my Christmas list. If you missed Small Business Saturday, it’s not too late! Stop by Out of Our Hands or any shop in your area and buy local, buy handmade for the holidays! I just sent out four custom pieces, and a few of them were Christmas gifts. 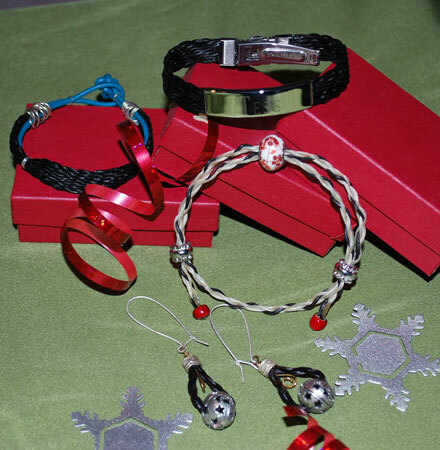 Have you ordered your horse hair jewelry for Christmas or Hanukkah gifts? Remember, only a few more days to get your horse hair to me to make custom jewelry for that horse lover in your life or even you (you deserve it, right?). Get it to me by December 1, and I’ll send back a unique holiday gift in time for Christmas. 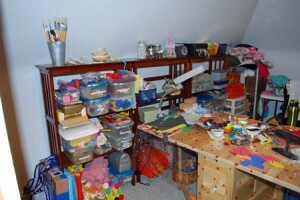 Keep in mind that all pieces ordered after Nov. 24 will incur a $20 per item rush fee. Can’t sneak out to the field in the time? Give a gift certificate for any denomination! Did you see that word up there in the title? 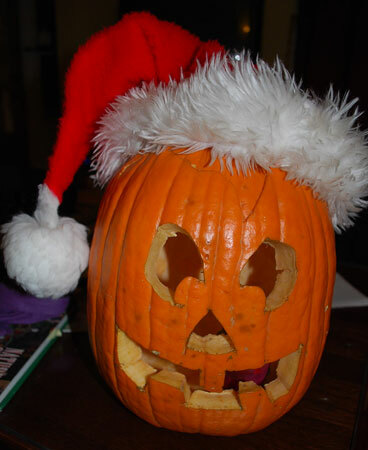 Personally I think all the holiday hoopla shouldn’t start until after Halloween. On Nov. 1 you can break out the Christmas carols and stores can heap upon us trees and sparkly ornaments and the like. But until Nov. 1, it’s still fall and pumpkins and trick or treat. On the other hand, I think about holiday gift giving year-round. I’m always shopping for the perfect gift. 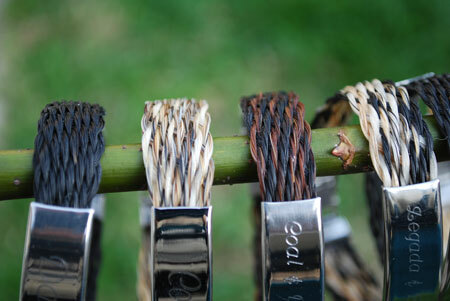 The perfect gift for the horse lover in your life is a custom horse hair bracelet! 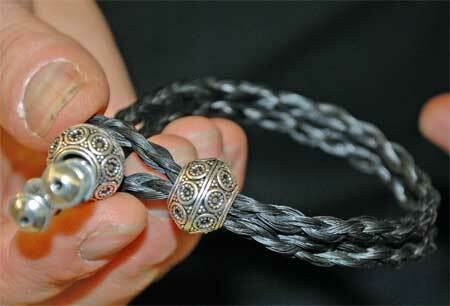 You send me the horse hair, I wash it and braid it, adding beads and sterling silver, even gold if you like. 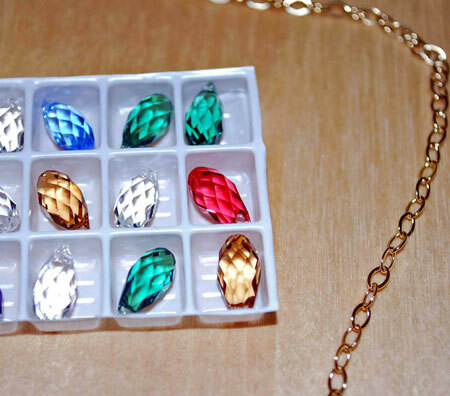 A piece of your favorite horse with you all the time. 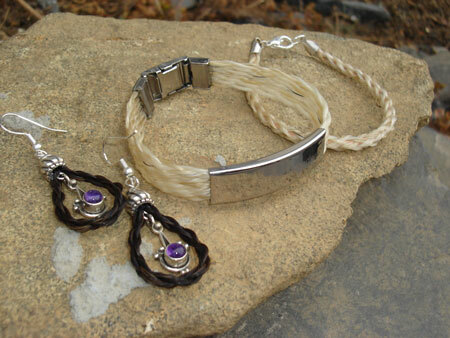 Check the horse hair tab above to check out the different jewelry styles. If you’re not able to sneak into the field and clip a bit of horse tail, I offer gift certificates for purchase in any denomination. You can also order custom jewelry without sending me horse hair and I will use the tails I have in stock. Choose from white, black, brown or any combination of the three. 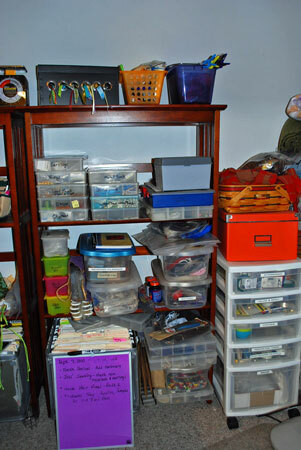 Creating this jewelry by hand takes time, so keep in mind these deadlines as you contemplate which horse hair jewelry piece to buy for a friend or put on your wish list. Horse hair must be in my hands for the order to be placed. Send your horse hair to me as soon as possible. I prefer to have horse hair before November 24 for custom pieces. Any horse hair arriving after November 24 will incur a $20 per piece rush fee for Christmas delivery. All horse hair must be to me by December 1 to be made into jewelry for Christmas delivery. Gift certificates are available any time and do not expire. If you choose to pay with PayPal, I will invoice you when I receive your order. 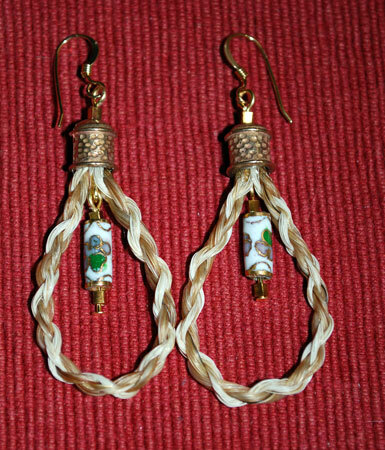 30 horse lovers + beads + cones = lots of horse hair tassels. Tuesday night I introduced the Timbertalk Trotters to the art of horse hair tassels. This Montgomery County 4-H horse club has members from 8 to 19 years old and all of them had a blast making tassles. Even the moms joined in. Some people brought their own horse hair and a few donated mane hair, which makes soft, fluffy tassels. 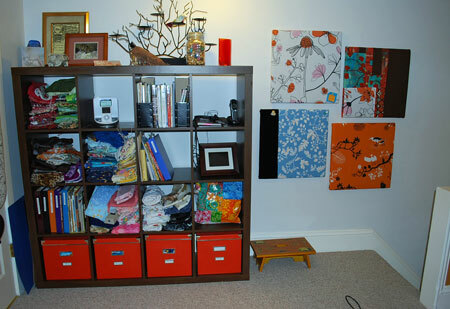 I set them loose on a box of beads and the kids turned ordinary tassels into one-of-a-kind pieces of personal art. 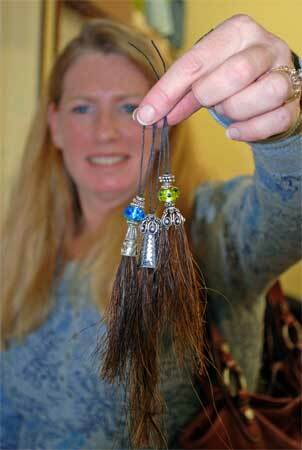 Three of the members of this 4-H group are proud owners of Red-Tail Designs Horse Hair Jewelry. One just received her horse hair bracelet with name plate in June as a high school graduation gift from her mom. My budding horse lover came along to help me teach and to get a glimpse of 4-H. She begged me the whole way home to join. I see 4-H meetings in my future. If your 4-H club, Girl Scout troop, Boy Scout troop or other group would like to learn horse hair tassel making, contact me. Even the moms were in on the action of making tassels. In fall my friend Courtney added these beautiful Swarovski briolettes to our Rio Grande order, and I just had to have some, too. 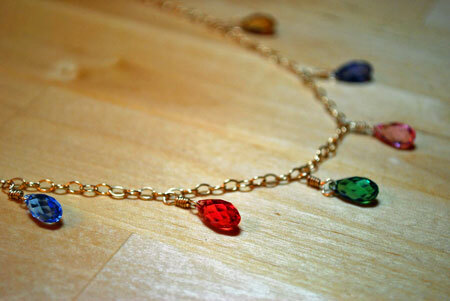 This is how I envisioned this necklace from the moment I saw those sparklies and here it is finally! Fresh from the creative cave just this morning. My studio is almost done, the taxes filed and the house project caught up (as much as house projects can ever be caught up) so this morning I just played in my refurbished studio. The Lehigh Valley Guild of Craftsmen I belong to is having a Craft Challenge with the theme being “Spring.” I just may submit this as my entry. Looks liked drops of spring to me. Unfortunately these photos don’t show the intense sparkle of the all the cuts of these gems. Anyone know how to capture that with a camera? Christmas is a-comin’ and you have just 5 more days to get horse hair to me for custom pieces. December 10 is the last day I will accept horse hair to be transformed into jewelry and delivered in time for Christmas. At this point a $20 rush fee is added to all orders. In other financial news, I’ll be raising my prices in January. Sad but true. I haven’t raised my prices in quite a long time, but the price of gold and silver have skyrocketed in the last year. To keep up with the times, I need to raise my prices. So get those orders in before the end of the year to take advantage of this year’s prices. We cut down our Christmas tree today in the wet, blinding snow. It was definitely the snowiest tree-gettin’ we’ve ever had. Makes it all the more festive. As per tradition, we headed over to Pearly Baker’s for some Boulder Style French Onion Soup afterward. Warms you up fast! The Kahlua in my hot chocolate warmed me up even faster! I hope you all have a joyous holiday season, no matter what you celebrate.